The protoplanetary disc around the young star TW Hydrae is the closest known example to Earth, at a distance of only about 170 light-years, closely resembling what astronomers think the Solar System looked like during its formation more than four billion years ago, representing a milestone for understanding how organic molecules are incorporated into nascent planets. The Atacama Large Millimeter/Submillimeter Array (ALMA – http://www.eso.org/public/teles-instr/alma/) is the most powerful observatory in existence for mapping the chemical composition and the distribution of cold gas in nearby discs. These unique capabilities have now been exploited by a group of astronomers led by Catherine Walsh (Leiden Observatory, the Netherlands) to investigate the chemistry of the TW Hydrae protoplanetary disc. 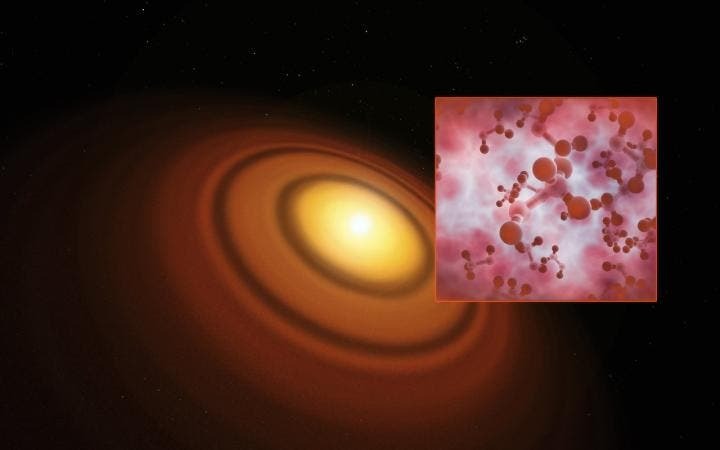 The ALMA observations have revealed the fingerprint of gaseous methyl alcohol, or methanol (CH3OH), in a protoplanetary disc for the first time. Methanol, a derivative of methane, is one of the largest complex organic molecules detected in discs to date. Furthermore, methanol is itself a building block for more complex species of fundamental prebiotic importance, like amino acid compounds. As a result, methanol plays a vital role in the creation of the rich organic chemistry needed for life.